When I recently emailed our local Friends of the Earth group telling them about a forthcoming talk by Mark Lynas at Reading Skeptics In The Pub I got a reply from a friend, who’s one of our Green Party parliamentary candidates, saying she thought it was “sad” that Lynas had gone “pro nuclear”. My response turned into a bit of an essay. I hope it may be of interest to others. When I was a kid “Atomic Energy” seemed great: the technology of the future. The whole idea of an atom splitting, releasing a neutron which splits another atom … and just how much energy a tiny amount of matter can produce, was awesome; the epitome of the white heat of the technological revolution we were living through, with our first ever Minister of Technology. But as I grew older I learned something of the darker sides of the world around me: what had happened at Hiroshima and Nagasaki, the murderous Vietnam War still raging, the Thalidomide tragedy, and the victims’ battle for compensation, how DDT and other pesticides were poisoning wildlife. I don’t know when I first revised my opinion of nuclear power – perhaps starting with the Karen Silkwood affair – but from around the time of the film “The China Syndrome” and the Three Mile Island accident, until a few years ago, I was set dead against it. I thought nuclear power plants were shoddily built with inadequate attention to safety. I had read Stewart Brand’s interview with former Apollo astronaut Russell “Rusty” Schweickart in the Summer 1979 edition of Brand’s “Co-Evolution Quarterly”; Schweickart was science advisor to California governor Jerry Brown at the time of TMI and “studied all the available technical information on Three Mile Island, including the entire transcript of the NRC deliberations during the crisis”. The interview presents an illuminating – and dismal – view of the shortcomings of the nuclear power industry considered from the point of view of someone with immense experience in safety-critical engineering systems. It seemed another example of greedy capitalist corporations playing fast and loose with public safety. I was also aware that nuclear power arose as a spin-off from nuclear weapons, and went hand-in-glove with them, with the Plutonium produced in nuclear power reactors being extracted to make bombs. I thought that generating waste such as Plutonium 239 with its half-life of 24,000 years, needing to be isolated from the biosphere for hundreds of thousands of years, was almost criminally irresponsible. And I didn’t think it was necessary. I thought we could get all the energy we needed from sun, wind and wave power (I even went out of my way to get a variant on the ubiquitous Smiling Sun badge with the slogan “Nuclear Power – No Thanks We’ve Got One” which, I thought, made the point quite neatly). But until recent years I didn’t realise quite how certain climate change, and the effects it is likely to have, are. For most of my life we seem to have been living under the shadow of impending apocalypses. I was 9 years old at the time of the Cuban Missiles Crisis and don’t consciously remember it, though I daresay I picked up on the terror many adults felt at the time that the world was on the brink of nuclear war. Later, during the 1980s when Thatcher and Reagan were deploying nuclear-armed Cruise Missiles at Greenham Common and talking openly of a “First Strike” attack against the Soviet Union, many of us seriously feared a nuclear holocaust would erupt. And from Rachel Carson’s “Silent Spring” documenting the devastation of wildlife by pesticides such as DDT, through depletion of the ozone layer being predicted to destroy much of life on Earth, to confident assertions that we’d run out of oil by the year 2000, predictions of environmental disaster have come and gone like Harold Camping’s prophecies of the end of the world. So I’ve been predisposed to think that global warming and the effects predicted for it would turn out to be similarly overhyped. But maybe not this time. Maybe the thousands of scientists working in fields from meteorology to botany and space science to oceanography, have got it right and the planet really is warming. And maybe rising sea levels will claim huge areas of land, and storms and freak weather events destroy and disrupt people’s lives and food supplies, and even lead to more earthquakes and tsunamis! Maybe tens of millions of people really will suffer and millions die. And maybe that’s an optimistic estimate. So we need to do something. We need to do a lot. And we need to do it quickly! What and how? Clearly we need to stop putting more Carbon Dioxide into the atmosphere, by reducing our consumption of energy and, for what we do need, replacing fossil fuels with energy sources with less carbon impact. So obviously solar (thermal and PV), wind, wave (I was a long-time fan of Salter’s Duck and believed that a promising renewable technology had been suppressed by the malice of the UK Atomic Energy Authority under whose auspices it had been evaluated) and other “renewables” were the way to go. Reading MacKay’s estimates (and one doesn’t have to take his word for any of them: he shows his sources and his workings-out for all to see and check) I realised that although renewables can produce enormous amounts of energy, our consumption (not just of electricity but fuel for heating, transport, industry, agriculture etc) is even more enormous. 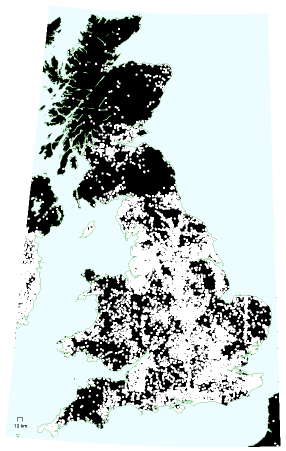 Whilst there is some scope for saving energy by improvements in building insulation, more efficient forms and use of transport etc, there are physical limits (MacKay is a physicist) to what is possible as well as limits to what we might expect people to accept voluntarily (MacKay is wryly ironic about this, showing for instance a map of UK land area covered with white dots representing areas you can’t site wind turbines because people don’t want them near to them, whilst the black areas are places you can’t have them because you don’t want to ruin the appearance of the countryside!). There is also the problem of intermittency of wind, solar and most other renewables. I know there are arguments about how much of a problem this is, e.g. if one can build a big enough, trans-continental electricity grid one can import, say, hydro-power from Scandanavia when the wind is not blowing in the UK, but it looks as if, in practice, we will be burning fossil fuels to fill in the gaps for renewables until we get some massive (and expensive) energy storage and/or demand-management facilities built. MacKay also makes the point that nuclear energy has its dangers but it’s not infinitely dangerous and we should compare it with the dangers of other sources of energy. And indeed the EU “ExternE” project has done just that: compared the “external costs” (including death, sickness and environmental costs) of various sources of energy, and they find that nuclear is one of the safest, with the fewest deaths for the amount of energy it produces. And NASA climate scientist James Hansen, whose 1988 testimony to the US congress was so influential in putting AGW on the political agenda, has also calculated that, ignoring climate change and looking simply at deaths from air pollution caused by burning coal, nuclear power has over the years saved almost 2 million lives by displacing coal. So looking at the dangers of nuclear power, even if Helen Caldicott and Greenpeace’s widely-discredited figure of 1 million deaths from Chernobyl were true (their figures even attribute diseases such as cirrhosis of the liver to radiation without considering possible alternative causes!) nuclear power would still have saved almost twice as many lives as it had cost. As for Fukushima and Three Mile Island – plants which, unlike Chernobyl, are of the same general type used widely today – although Fukushima has produced a horribly expensive mess to clear up, it seems that the only detectable harms to health are likely to be through fear of radiation rather than radiation itself. Although the clear-up operations have already claimed two lives and can be expected to extract more due to “ordinary” accidents of the sort one expects in the construction industry in general, but which which we seem to accept without the bat of an eyelid in the case of construction of wind turbines, hydro projects, erection of solar panels on roofs etc. So I no longer oppose nuclear power on safety grounds. MacKay shows two example scenarious for sustainable British energy not depending on nuclear power; the Greens-friendly one (not involving “clean coal”) requires the UK to have 4 times as much wind power as the whole world had in 2008, to convert 100 of our major lakes and lochs into pumped-storage schemes, and to import one-seventh of our energy from massive solar plants in the North African desert. Is this really going to happen? We could get the figures down by some draconian energy-saving measures like forcing people to turn the heating down in their houses (how?) and workplaces (easier), prohibiting or severely discouraging most private transport and air travel and getting people onto buses and trains instead, getting people onto predominantly vegetarian or vegan diets, reducing the amount of stuff we consume and so on. That would help for the UK but globally there’s currently a huge increase in fossil fuel and especially coal burning in the developing economies which have had very low per-capita energy consumption but are aspiring to first-world standards of living, with corresponding appetites for energy. Can we, without gunboat diplomacy (which is not an option with the biggest developing economy: China) force billions of the world’s poorer people to stay energy-poor? If not how do we – the world – meet their needs without worsening climate change? Could nuclear power solve our problems? Not with current nuclear technology. As MacKay calculates, there’s not enough Uranium to supply the world with energy using once-through reactors of the sort we currently use for very long. But it can be a useful short-term stop-gap: France currently generates three-quarters of its electricity from nuclear, producing about half as much CO2 per head of population as Germany does; we should certainly not be shutting down existing reactors. And our current reactor designs are no doubt a lot safer than those of the TMI/Fukushima era (Russell Schweickart predicted a TMI-level accident every 2 to 4 years using the technology of the time, so they’ve obviously improved safety a lot over the intervening decades) but they’ve also become a lot more expensive (probably due to the extra layers of safety measures and tighter regulation). With current first-world improved safety measures etc there are many countries that couldn’t afford to build many (if any), and if safety controls were relaxed to make them cheaper we have higher risks of occurrences like Fukushima, which could be financially crippling for poorer countries even if they didn’t lead to great harms to people’s health. And we still have the issue of long-lived nuclear waste. If we don’t deal effectively with global warming that may be of academic concern: a worse (not even worst) case scenario could see our civilisation collapse and huge populations wiped out so that any hazard from waste would make little difference to the overall fate of survivors. But if we’re hoping to avert the worse case scenarios then we should at least think about what we could do with this toxic legacy. What can we do about nuclear waste? In my anti-nuclear days I hadn’t heard of Alvin Weinberg. A decade before Hansen, Weinberg was warning of the danger of global warming due to fossil-fuel burning; he was also a trenchant critic of the (poor) safety standards of current nuclear power reactors with their capability for melting down, and was concerned about the possibility of weapons proliferation through diversion of fuel materials. At the US’ Oak Ridge National Laboratory he oversaw the design, construction and testing of a reactor based on Thorium, rather than Uranium, using a molten salt as both carrier of the fuel and coolant. This Molten Salt Reactor is inherently safe: if it loses power it simply shuts itself down (apparently at the end of each day at the lab they used to simply turn off the power and go home!). Thorium is 3 or 4 times more plentiful than Uranium (and is often found alongside rare-earth elements needed for making wind turbines, making them too expensive to extract in the US where the thorium has to be treated as radioactive waste, resulting in world dependence on China for rare earths, where environmental regulations are looser and/or laxly enforced resulting in horrific chemical and radioactive pollution from the industry that is key to producing ostensibly “clean” wind energy generators). Thorium MSRs produce no materials useful for weapons. Ironically it was apparently for this reason that the Oak Ridge MSR program was shut down in 1969, when Uranium-fuelled reactors were seen as essential for production of plutonium for the West’s increasing stockpile of nuclear warheads, and the MSR was seen as a diversion from this aim. Now of course our priorities are diametrically opposite: we would prefer that civil nuclear power were inimicable to proliferation. How much easier it would be to police Iran’s (and other countries’) nuclear power program if we could simply look at whether they were working with Uranium or Thorium! Another feature of Thorium-fuelled Molten Salt Reactors (also known as LFTRs: Liquid Fluoride Thorium Reactors) is that they require a small amount of radioactive Uranium or Plutonium to get their reaction going and that they burn up this material as they operate, producing very little waste in the process and what waste they do produce is dangerous for a far shorter time than that from conventional reactors: of the order of decades rather than tens of thousands of years. They can consume existing nuclear waste as their “starter” material thus effectively burning it up, producing a much smaller quantity of much less dangerous stuff, and making copious amounts of energy in the process! Former NASA engineer Kirk Sorensen and, more recently, former anti-nuclear campaigner Baroness Bryony Worthington have been publicising the advantages of MSRs/LFTRs, and MIT-spinoff company Transatomic is currently raising funds to develop commercial reactors. The Chinese Academy of Sciences is also spending $350 million into developing this technology (with some urgency due to its notorious smog problems) so it seems only a matter of time before such designs are available more-or-less off-the-shelf. Apart from inherent safety, more plentiful fuel supply, more efficient use of fuel, less waste production and the ability to dispose of existing nuclear waste MSR/LFTRs are amenable to being designed as small units built in factories and shipped to their destinations, rather than being enormous constructions built on their operating sites as present nukes are; and since they produce heat at far higher temperatures than conventional reactors (800C or over, rather than the 300-400C available from pressurised water designs) they can be used for process heat in the chemical industry such as production of ammonia for fertilisers, and liquid fuels, and even for aircraft power plants (one of the original applications this technology was investigated for: apparently before the US had Inter-Continental Ballistic Missiles to bomb Russia with they wanted an aircraft that could stay aloft for weeks or months without refuelling, ready to launch a Doctor Strangelove-style attack on their enemies). It seems there’s another design that has many of the same advantages and lack of disadvantages as the MSR: the Integral Fast Reactor (IFR). Like the MSR this has been proven to work, at the US’ Argonne National Laboroatory where it ran until closed down by political meddling in 1994. Like the MSR the IFR is a “fast” or “breeder” reactor which uses its fuel very efficiently and burns up existing nuclear “waste”. General Electric-Hitachi seem so confident of its viability they’ve offered to build one at Sellafield to dispose of the UK’s 100-tonne stock of weapons-grade Plutonium, charging the taxpayer nothing for construction but being paid by how much they get rid of. Their proposal is to run the plant in such a way as to burn up the Plutonium as quickly as possible whilst generating a modest amount (by nuclear standards: about 600MW) of electricity as a by-product, but the material we have available could be used to power the country for centuries if we wanted to. MSR/LFTRs: inherently safe, very efficient, more plentiful fuel source (which also facilitates production of rare earths for renewable generators etc), waste-negative, potential for not just electricity generation (including CHP since they could be small and safe enough to put in the middle of housing or industrial estates) but also for direct use in the chemical industry, transport (including possibly aircraft), desalination plants etc; but a fair amount of development needed. How much development, and how long would it take? The Oak Ridge work shows that the principle works but producing designs which can run for long periods at high temperature producing higher power reliably and economically will present engineering challenges. How big are the challenges and how long would it take to develop the technology to make it mass-producible and reliable? One cannot know for sure, but consider: in six years the US went from a theoretical possibility to a working atomic bomb (not an achievement to be proud of, but a huge technical one); in a further 9 years they went from being able to make bombs to developing the reactor used in their first nuclear-powered ship. And 12 years after the world first put a small metal ball into space, four of Rusty Schweickart’s colleages had walked on the moon and come back. It doesn’t seem unreasonable to think that with the will and resources we should be able to get LFTRs into wide-scale production before the middle of the century. And if they are as simple and cheap as the technology suggests, they could out-compete increasingly-expensive fossil fuels, so we don’t have to arrange feed-in-tarriffs and other subsidies to encourage first-worlders to generate energy sustainably, and they should be affordable enough for the developing world to use instead of coal and oil. So I think this is what the environmental movement – including Greenpeace and the Green Party – should be aiming for. (I gather some folks at FoE UK had flirted with considering nuclear power on its merits though that seems to have come to nothing and they have reverted to policy-based evidence-making). Personally I’m not sure about whether we should be building more current-technology nukes: despite the limitations of their technology they are a known quantity and can supply a lot of our energy needs relatively quickly, but they shouldn’t distract us from developing and building more sustainable, safer, cheaper, more versatile and flexible designs, and doing so with the utmost urgency. And I think this is what the Greens should be campaigning for. If you hate conventional nukes and you’re serious about climate change then campaign for the rapid development and massive deployment of IFRs and LFTRs (and who-knows-what other better technologies are possible) that can help not just the UK but the rest of the world combat climate change effectively, can be cheap enough to build and run to put both conventional nukes and fossil fuels out of the market through economics, and can eat up existing nuclear waste to boot! I think global warming is the biggest issue there is. For years I’ve voted Green whenever there was a Green Party candidate to vote for. But when, in December 2012, I asked Natalie Bennett if the Green Party had a worked-out, MacKay-style plan for how we should balance our energy demand and supplies she claimed they had published one in their manifesto. But they haven’t. I used to be a Greenpeace supporter: I direct-debited them a few quid every month. But when I asked them about their energy plans they waffled and evaded and it was clear they had no clue either. So I stopped supporting them. David MacKay has been working with the Department of Energy and Climate Change and they have published an online calculator for working out how we might acheive an 80% reduction in fossil fuel use by 2050. It’s not perfect: one can only choose one of (at most) four options for each parameter such as how much transport is electrified or how many wind turbines to build, but it does offer a standard, level-playing-field way to compare different general approaches and gives a measure of the difficulty of implementing each factor. A few individuals have offered their scenarios, including Mike Childs of Friends of the Earth, Dustin Benton of the Council for the Preservation of Rural England, and Mark Lynas. If Lynas can produce a worked-out plan to reduce our carbon emissions by 80% by 2050 why can’t the Green Party and Greenpeace do likewise? And who has more credibility? Sadly it seems to me the Greens’ opposition to nuclear power is driven by emotion, not reason, and I won’t even consider voting for the Green Party or supporting Greenpeace again until they at least come up with rational, numerate proposals that add up to justify their policies. UPDATE I was wrong about Greenpeace not having an energy plan: they have; not for Britain, but one for Europe. However I think it’s seriously deficient as I explain here. This piece (and others by me) are also at my personal home page.